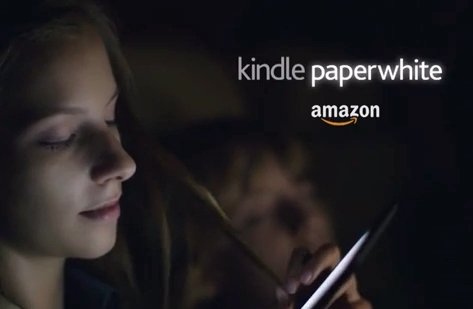 Amazon’s just released a new ad for their Kindle Paperwhite — and I wish I could put it into a time capsule. Because it perfectly captures a moment in the evolution of reading. Of course, from Amazon’s perspective, it’s just another way of reaching out to the people who are still resisting the idea of reading ebooks on a Kindle. But they came up with a really clever way to do it — and it makes for some very compelling viewing! You can watch the video of this ad — and all of Amazon’s newest Kindle ads — at YouTube.com/Kindle . This one is called simply “Real People, Genuine Reactions to the All-New Kindle Paperwhite “. And it’s the candid reactions that make it so much fun to watch! 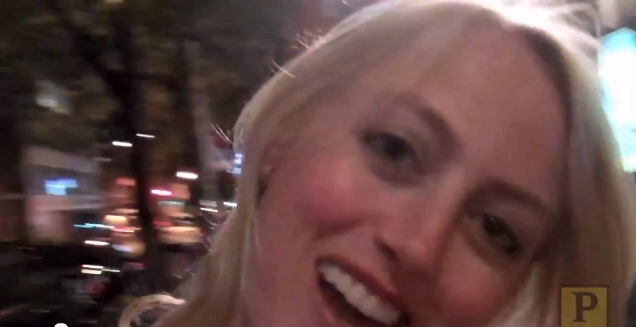 Amazon filmed people using their newest Kindle — and caught their reactions on a hidden camera! Amazon’s narrator explains enthusiastically that “We invited book lovers to try the new Kindle Paperwhite” — but that’s really an understatement. Because Amazon actually set up a miniature living room in the middle of a city plaza — and then invited people to sit down in its overstuffed furniture! It’s a nice gimmick, and it seems to have really made Amazon’s “test subjects” comfortable enough to open about their feelings on books. “I’m such a passionate reader,” one of their subjects explained — and another added “When I’m reading a book, and I really love what I’m reading, I get lost in the story!” But what’s remarkable is how specific they get about the advantages of the Kindle. Of course, by identifying the people in their ads as “book lovers,” Amazon is making a specific point of their own: that reading on a Kindle is just as much fun as reading a print book. (“I love it!” gushes one of their subjects at one point.) And another one even jokes that when Amazon’s through interviewing them about their new Kindles, “We’re not giving ’em back!” But one of the most touching reactions came from what looks like a couple who has been together for a long time. 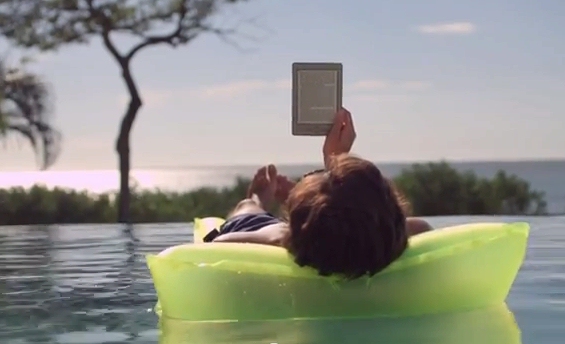 A Secret Summer Kindle Commercial? 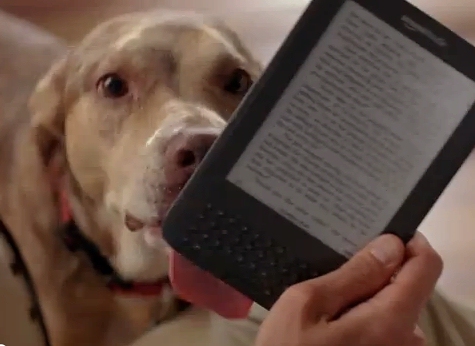 I love Amazon’s Kindle commercials. 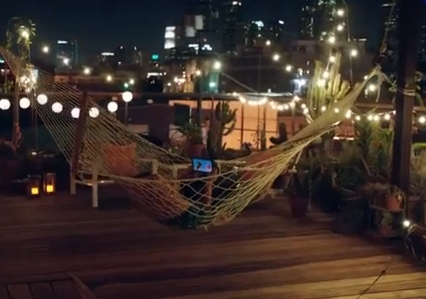 It’s really fun to see how a professional advertising agency captures the fun of owning a Kindle with flashy video clips and exotic music choices. 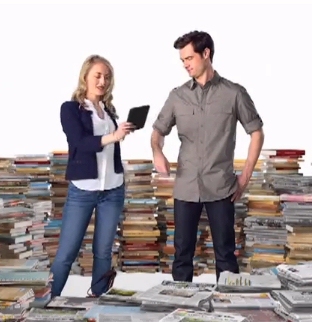 Today I discovered there’s one great Kindle commercial that most people haven’t seen. It’s airing only in England, but you can also watch it online on Amazon’s official channel for Kindle videos! 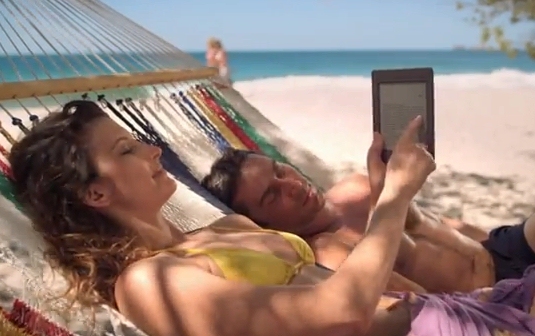 This cheerful ad shows lots of happy people enjoying their Kindle while they’re “on holiday” at the beach. (“Pack your Kindle,” urge the words appearing on-screen at the beginning of the commercial.) Those words appear over the image of a carefully-packed suitcase, but all the other video clips show a fancy summer resort. There’s a woman relaxing by the pool, a tall glass of lemonade, and a room with a view of the beach. But of course, each clip includes a Kindle as part of the fun! The video appears on Amazon’s official channel for Kindle videos at YouTube.com/Kindle. (On the same page, Amazon’s also webcasting some inspiring interviews with some self-published authors.) 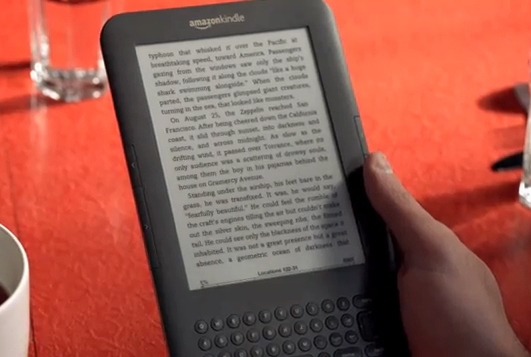 Altogether, Amazon’s online Kindle videos have been viewed more than 7,249,265 times. And yet so far, this fun summer ad has racked up less than 11,000 views. But at least some couples are still enjoying a lovely holiday together at the beach this summer — at least, judging by Amazon’s Kindle ad. To watch a video of the ad, point your computer’s web browser to tinyurl.com/DoorstepAd . Sunday Amazon slipped the URL onto their Faceboook page for the Kindle, calling it a “sneak peek” of their newest commercial (‘to help make the wait a little easier.”) Within 12 hours, it had already drawn nearly 1,000 “Like” votes — and more than 320 comments. It was like the commercial finally provided something new to talk about — while everyone waited for their own Kindle Fire tablets to be delivered! 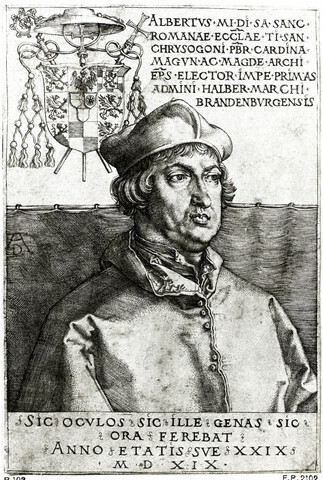 The ad’s official title is “Placing the Things You Love at Your Fingertips”, and it was fun to read all the enthusiastic reactions on Facebook — though the ad also drew comments from a few “armchair critics”. The biggest complaint was simply that it’s not possible to buy the Kindle Fire in Canada or the United Kingdom. (One comment summarized a typical reaction: “I…wish I could buy one.”) And another commenter was surprised that the deliveryman left the package outside. “People in America must really trust their neighbors,” joked one commenter on YouTube. But I have another theory about what’s behind the negative comments. 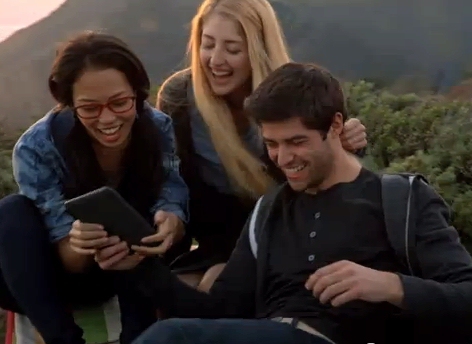 I think everyone’s just jealous because the woman in the ad already has a Kindle Fire tablet — and they don’t! I’ve always loved Amazon’s slick ads for the Kindle — and they’ve created another one to promote their new color/touchscreen “Kindle Fire” tablet. 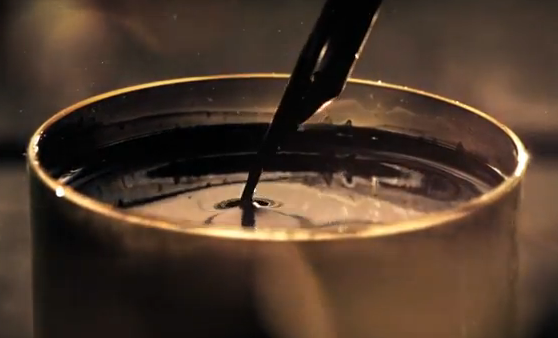 It opens with a quill pen lifting a drop of ink out of a copper pot. “The instruction we find in books is like fire,” the announcer intones — reciting a quote from Voltaire. What makes this ad so effective is its music, and I finally tracked down the original song. It’s called, appropriately, “Words,” by a young new band called the Givers. (They’re a Louisiana-based group which just released their first album, Light, in June.) You can hear the whole song in a video at tinyurl.com/KindleFireSong . It’s a stunning musical jolt with intense vocals and a pounding beat – and it’s got some strong lyrics to match. It almost reads like an ode to all the new self-published authors who are finding an audience on the Kindle. The words we say today, we’ll say. And we’ll see them again. Yes, we’ll see them again. To guide me through my actions at night. And we’ll see them again. We’ll see them again. The words go out so far, and come back so hard. So just hold up. Don’t fold up,. You’ll see them again, you’ll see them again. And you’ll see them again. You’ll see them again. The words we say, today, we’ll say. Yes we’ll see them again. We’ll see them again. She finally bought a Kindle! For five months, Amazon’s been running a series of ads where a patient young man talks to a blonde woman about his Kindle. But Wednesday Amazon released a new ad — the fourth in the series — where she finally admits she bought a Kindle for herself! Within two days, it had already been viewed nearly 100,000 times on YouTube, as Amazon’s announcement about four new Kindles finally intersected the series of ads. “I’m very happy to be a part of them,” the actress posted Wednesday to her Twitter feed (adding “Can’t wait to hear what else they announce.”) And she also posted a funny story about her honeymoon last month in Greece. “Excited 2 find 1 Greek who owns a #kindle & will let me use his charger. I’ve created a shorter URL where you can watch the ad online, at tinyurl.com/SheBuysAKindle . So what happens in the newest ad? Here’s a transcript. It opens when the young man sees the blonde woman smiling, with a red ribbon wrapped around a new, gray Kindle. Part of me wonders if “What’s up, happy pants” will become a new catchphrase. (“I think that’s a seriously strong double entendre,” says my girlfriend.) But I really enjoyed the ad — and it looks like it’s already getting people excited about the new low cost of a Kindle. “That’s cheap enough for me to consider buying one,” reads a comment posted on YouTube. 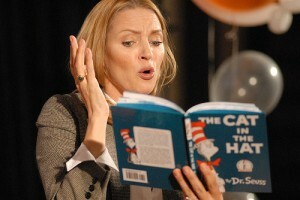 When she was chosen for Amazon’s Kindle ad, Amy Rutberg was a stage actress. (Though according to the Los Angeles Times, years ago she’d considered going to law school after college…) And even before the Kindle ad, she’d already had an interesting career. She appeared in an L.A. theatre production of “Man of La Mancha” which started Robert Goulet, as well as a Los Angeles production of The Rocky Horror Picture Show,” and she once did a scene with Jeff Goldblum on an episode of Law and Order. And once she even played Helen Keller in a parody of bad Broadway musicals! But this fall, Amy appeared in a New York stage play billed as a “holy outrageous new comedy” called “The Divine Sister.” One site described it as an “outrageous comic homage to nearly every Hollywood film involving nuns: The Song of Bernadette, The Bells of St. Mary’s, The Singing Nun and Agnes of God.” A convent’s Mother Superior was played in drag by Charles Busch — who also wrote the play’s script. His other plays include “Psycho Beach Party” and “Vampire Lesbians of Sodom” — and Amy Rutberg played a character named “postulant Agnes”. Four months later, in March, the play closed after 253 performances and an eight-month run in a 199-seat theatre. 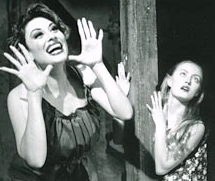 But The New York Times had called Amy’s performance in the play “delightful”, and Backstage magazine said she gave her character “an appropriately off-kilter spin.” In an apparent parody of Meg Tilly’s role in “Agnes of God,” Amy played a postulant “possessed by visions and voices,” and Curtain Up magazine hinted that her character ultimately “develops something of a Jeckyll and Hyde persona…” And in this video, Amy’s preserved that magical moment in time when the play was in the middle of its run — and at least part of the video was shot backstage during an actual performance! (To watch part 2 of the video, point your web browser to http://tinyurl.com/AmyRutberg2 ). I just got a message from the woman in Amazon’s Kindle commercial! I’d told her that I finally saw her third Kindle commercial for the first time on Friday night – and it almost made me want to buy a second Kindle! She wrote back, “happy to hear that, and next time buy that second kindle. It all started with a simple question. “Who’s that woman in Amazon’s newest Kindle commercial?” I’ve been asked this a few times, so I finally searched the web for an answer. The name of “that blonde woman” is Amy Rutberg, and it turns out there’s some surprising and funny stories online about her life before the Kindle ad. Plus as far as I can tell, in real life she’s already using a Kindle! Amy is 29 years old, a professional actress who recently moved back to Los Angeles from New York. (And two weeks from this Wednesday, she’s leaving on her honeymoon in Rome!) 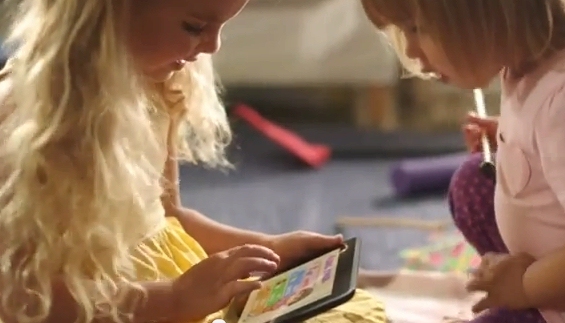 She may seem a bit ditzy on that Kindle ad, but in real life, she’s surprisingly intelligent. Amy actually started college at the age of 13, according to one online profile, and by the age of 15 she’d transferred to UCLA as a junior, making her one of the youngest students ever accepted to the college! “When not performing on stage I can be found playing poker, not finishing a screenplay, shopping for the perfect pair of boots or reading my Kindle ;-)” she jokes on her Twitter feed. But when that famous Kindle ad finally aired, her mother stumbled across a blog post where her daughter was described as “hot but 2 skinny”. According to another funny Twitter update, Amy remembers that her mother said “they must have u mistaken 4 tmobile girl”. Amy then added a very special Twitter tag at the end of her post — #thanksmom. If you’d like to see more of “that Kindle girl’s” work, you can check out her professional blog at amyrutberg.com, which features a “reel” of short clips from her appearances on different TV shows. Last year Amy appeared on an episode of “Law and Order,” and she did another episode just two years earlier (plus an episode of “Law and Order: Criminal Intent”.) In 2006 she played a nurse on an episode of “As The World Turns”, and she even starred in an episode of the TLC reality show about shopping for a wedding gown — “Say Yes to the Dress”. 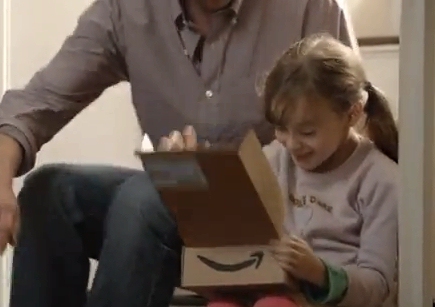 But she’s been doing lots of live theatre, so Amazon’s TV ad was a big moment. Amy’s Twitter feed captures a fun moment in the life of a rising actress — seeing you’re own work while you’re casually watching TV. “Kindle commercial on @snl… Love it!” she tweeted on April 30th). 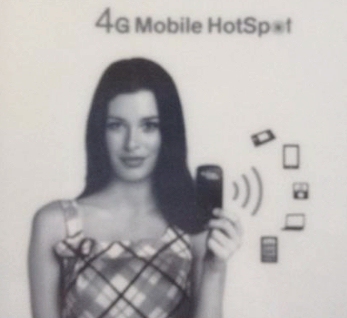 And by May 13th, she’d sent a shout-out to some friends on Twitter who’d spotted her in the ad. “Thanks for all the kindle love peeps! How much has Amazon spent on TV ads for the Kindle? Just last year, they spent over $82 million, according to an article in Ad Week magazine. That’s more than four times what they’d spent the year before — just $19 million, according to the magazine. And Amazon’s apparently spending plenty of money in 2011, too, since I just saw the third ad in that series where two friends discover the advantages of owning a Kindle — a young woman and a young man. You can watch the new ad, plus all of Amazon’s other Kindle ads, at the Kindle’s page on YouTube (at youtube.com/Kindle ). It’s a funny ad — but it’s even funnier if you read the comments that people have left below the video! I’m assuming it’s original song — played on a xylophone — that was written just for Amazon’s Kindle ad. But at least three other commenters had an even more burning question. But his bigger issue was just more of a general suggestion for the publishing industry. When you buy a printed book, he argued, the publisher should bundle the ebook with it — for example, with a “download code” that you could enter to activate the complimentary digital version on your Kindle! “I have the Kindle app for my phone and it is 10x better than the Nook app. I’ll read books on my break at work and just buy a new one when I’m finished with the last one, instaed of having to wait until I get home to pick out a new book. I’m fascinated by all the surprises packed away in Amazon’s Kindle ads. 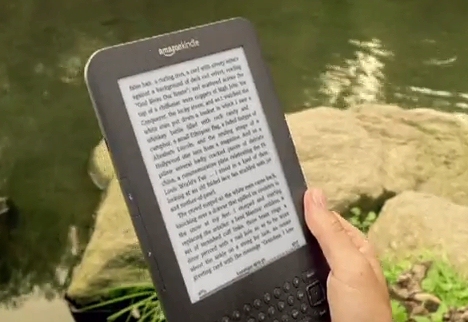 Remember the instrumental guitar song in the background of Amazon’s previous Kindle ad. 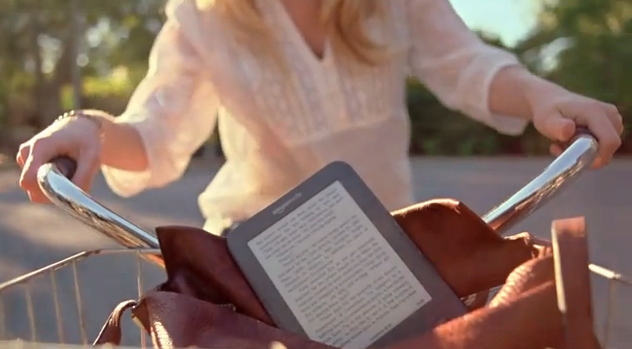 (The “zest” ad, where the Kindle appears in a bicycle basket, and even gets licked by a dog?) For the ad, Amazon selected the part of the song where the vocalist is just singing “la la la” over a steady rhythm from clapping hands and maracas. But it turns out the longer version of the song actually has lyrics to it! You can hear the lyrics when you download the full version of the song from Amazon.com. (It’s free! And I even made an easy-to-remember URL for your web browser — tinyurl.com/kindlead ) The song is by Bibio, a British music producer who (according to Wikipedia) has had his songs appear in commercials for Toyota, L. L. Bean, and even Adult Swim. And this time, they’re a perfect fit — almost like a poem about the Kindle itself. 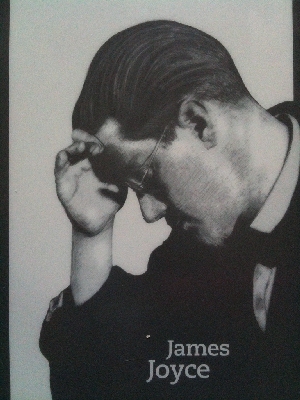 It reminds me of faces of the famous authors that appear as the Kindle’s screensavers. Those are some pretty heavy lyrics for a Kindle ad. If you’re looking for something lighter, remember that the earlier Kindle ads also had some lyrics, and in a romantic twist, the second ad’s lyrics were written by the song’s two singers — Annie Little and her real-life fiance, Marcus Ashley! a moonbeam. What a lovely girl. I love you. Don’t you see? You stole my heart, and I’m gonna steal yours too. But Annie wrote all the lyrics herself for the Kindle’s first ad. I’ve really enjoyed Amazon’s Kindle ad campaigns. 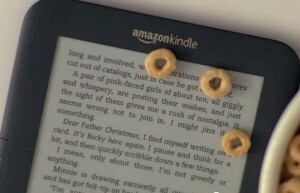 And remember, you can watch all of Amazon’s Kindle ads by pointing your web browser to YouTube.com/Kindle!